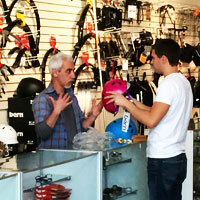 We’ll determine your preferred riding style (speed, fitness, commuting, and lifestyle. we’ll take you over to several models which will suit your needs. From there, we’ll get you sized and send you out for a few test rides. Based on your feedback we’ll narrow the models down to what felt most comfortable and appealed to you the best. After that, we’ll make a few more adjustments and send you out for another test ride. All that’s left is to get the fit dialed in just right and set you up with any accessories you need for safe and fun rides! This typically includes a helmet, gloves, multi-tool, hydration (cage/bottle or pack), pump, tube and storage. Unlike some companies that sell over the internet and follow a “once you’re out the door, we don’t know you anymore”, we pick quality brands that support their product. If you discover a manufacturing defect that is covered by the manufacturer’s warranty, we will contact the manufacturer, and do all the replacement labor for free. Shipping charges may apply.And don’t forget our One Year Free Service plan. You won’t get that on the internet!